The National Union of Mineworkers (NUM) notes and welcomes the Cabinet reshuffle by comrade Cyril Ramaphosa last night. We also welcome the appointment of comrade Gwede Mantashe as the new Minister of Mineral Resources. 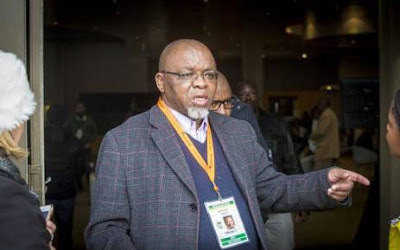 "Comrade Gwede Mantashe comes from the mining industry and was the General Secretary of the NUM. He knows the mining industry very well and we are hopeful that he will make some changes. We expect him to do his job as the Minister of Mineral Resources and must not please us.We will do our best to support him and we do not want him to be biased. We do not want any favour from him. He must comply and do everything within the laws of this country. We are happy and we wish him all the best in his new position. We hope the department will be resuscitated by the new minister and serve all the stakeholders in the mining industry including rival unions," said William Mabapa, NUM Deputy General Secretary. The NUM is very happy that the former Minister Mosebenzi Zwane has finally been removed.
" We have been saying that since the departure of comrade Ngoako Ramatlhodi as the Minister of Mineral Resources there was never had a minister in that department. We had a minister that was employed to come and assist a particular faction, in particular, the Guptas. All the stakeholders in the mining industry had a problem with Mosebenzi Zwane. The NUM never had a good relationship with him. Zwane was the only minister that we had a problem with. He has proved himself that he was a failure and he was removed for being a failure. It is our view that this cabinet reshuffle is a blessing in disguise," Mabapa added. William Mabapa: NUM Deputy General Secretary: 082 880 4439.